ZeroPC bridges the gap between Internet and PCs by providing a seamless all-in-one content management hub for organizing, accessing, managing and sharing all of your digital content. 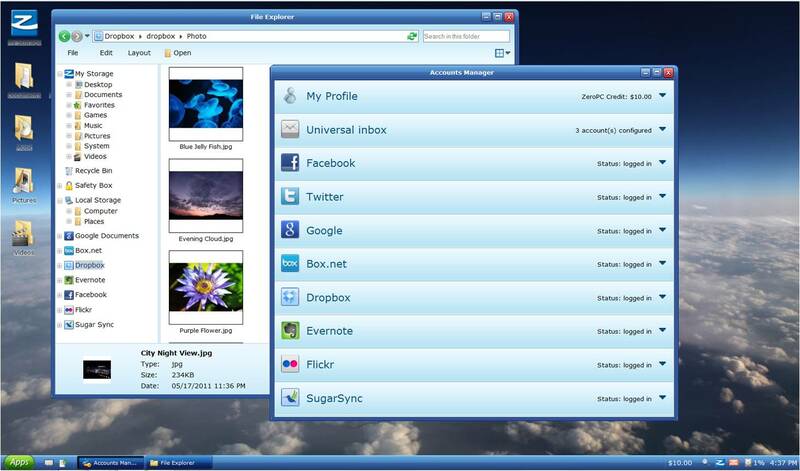 ZeroDesktop™, Inc., provider of next-generation Web Desktop solutions, today announced expanded integration features with popular Web storage services including Dropbox, Evernote, Box.net, Google Docs and SugarSync, plus integration with the user’s own local PC storage, for its ZeroPC™ (http://www.zeropc.com) cloud content management user interface. ZeroPC bridges the gap between Internet and PCs by providing a seamless all-in-one content management hub for organizing, accessing, managing and sharing any digital content stored on a user’s local PC, social sites, portable storage devices or external storage services, all from one location regardless of where their content is stored. ZeroPC eliminates the challenges of having to remember multiple logins, learn different user interfaces and navigation styles, and install client software to use the many Web storage solutions that are currently available. While online from any location and using any browser, computer users can unscatter their digital content by simply logging in to their ZeroPC virtual cloud computer account and “see” all of their documents, emails, photos, music, videos, and social media content that are currently stored on external storage sites, including ZeroPC’s new integration with Dropbox and Evernote. Combinations of digital content—multiple folders, multiple files and sticky notes—can be easily and securely accessed, managed and shared using a single URL. 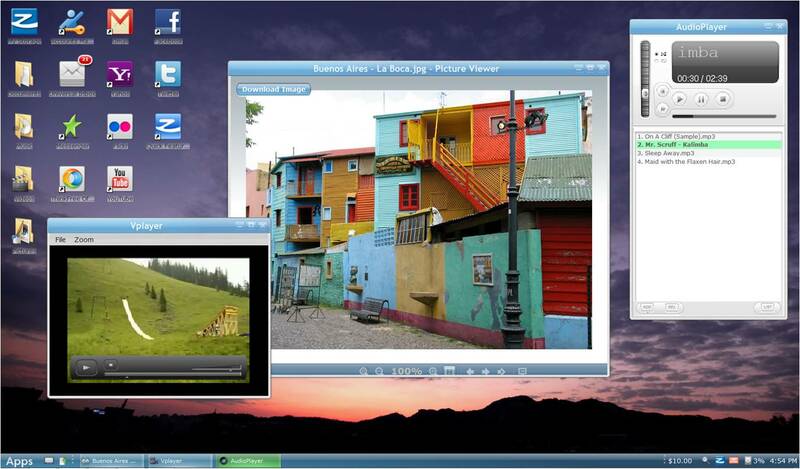 Using any browser, ZeroPC users can view, play multimedia, modify and save content directly to popular external Web services without first downloading the content to their local computer or installing software. Users easily sign-in (Oauth) to their Dropbox, Evernote, Box.net, Google Docs or other external accounts from their ZeroPC Accounts Manager which aggregates user content. Familiar, easy drag and drop techniques are employed to access and move scattered Internet content between locations—from local PC to cloud service and content in one cloud service to another cloud service. At no additional expense, ZeroPC includes ThinkFree’s Online Office Suite that looks, feels and delivers performance that is 100% compatible with familiar Microsoft productivity tools. ZeroPC users can create, view, edit and save documents, spreadsheets and presentations directly to their Dropbox, Evernote, Box.net, Google Docs, or other external storage accounts. As an added convenience, ZeroPC users can post content directly to Facebook and Twitter without opening separate browsers or multiple logins. Friends and colleagues only need to click on a short URL in the user’s tweet or Facebook Wall to be able to instantly access shared photos, videos and files. ZeroPC users can now import additional Web apps and local apps with attractive icons for direct access to their favorite external links such as news sources, shopping sites and numerous others. Because ZeroPC resides in a cloud, users never have to worry about computer crashes or viruses that may corrupt important documents, letters, photos or other valued keepsake items. ZeroPC is designed with additional security layers and dual-password protection as opposed to other Web services that only provide a URL link which may not be secure. Users can securely lock away all of their content in their own “safety box” which no one else can open. A full list of ZeroPC’s rich features is available at http://www.zeropc.com/features.htm. End-users can have instant, full access to all of ZeroPC’s rich functions and applications, and up to 50GB of storage for their content, by signing up for their own ZeroPC account at https://www.zeropc.com/login/?mode=register. No credit cards or subscription fees are required—only an email address, Facebook or Google account are needed to sign-up. End-users who sign up now will receive $10 in instant ZeroPC Credits. Headquartered in San Francisco, CA, ZeroDesktop, Inc. is a global provider of Web Desktop solutions that change the way users share their digital content with friends and colleagues. ZeroPC (http://www.zeropc.com) is a revolutionary cloud content management user interface that turns any browser into a PC and empowers consumers, schools and business users to unify all of their digital content from local PCs and Internet sites into one secure repository. ZeroPC’s “transferable desktop” is a temporary desktop that allows users to access and share a variety of content from any browser using an intuitive and unified desktop user interface. ZeroPC provides the most comprehensive and functional desktop in the cloud with its rich combination of supported Web apps, local apps and native apps ranging from productivity tools to collaboration to social networks. Using a flexible “pay-as-you-go” model, no subscriptions are required and there is no software to install. Consumers, education and business users can join the ZeroPC Community today by becoming a fan on Facebook at http://www.facebook.com/pages/ZeroPC/123497937724818 and following @ZeroDesktop on Twitter at http://twitter.com/#!/zerodesktop. ZeroDesktop is headed by CEO Young Song, an entrepreneur whose career focus has been on bringing to market synergistic desktop computing products that deliver life-enhancing value to education, business and consumers. He founded NComputing, a $40 million venture-backed company with patented technology that leverages PC power and cloud computing to create a share computing resource that connects multiple users at a low cost, and is used today by millions of customers in over 100 countries. He also co-founded eMachines, the low-cost computer brand that enabled affordable PC ownership and Internet adoption for consumers (later acquired by Gateway). ZeroDesktop and ZeroPC are trademarks of ZeroDesktop, Inc. All other trademarks are the property of their respective owners. Access, manage and share any digital content stored on a your local PC, social sites, portable storage devices or external storage services, all from ZeroPC. 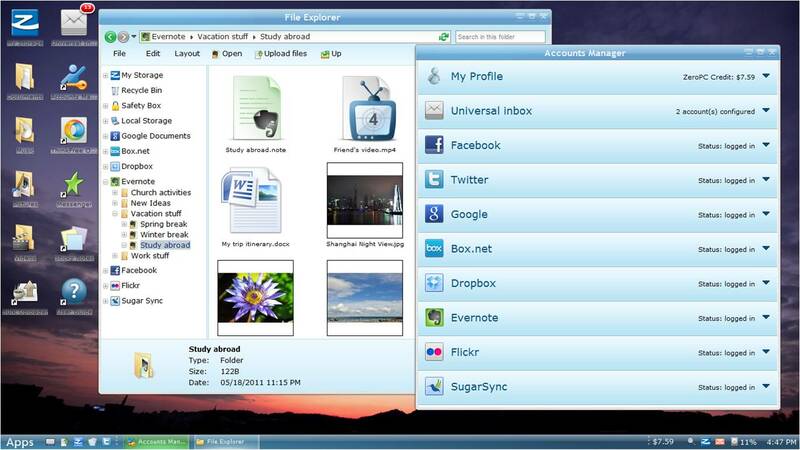 ZeroPC adds support for Evernote & Dropbox for a full Web Desktop in the cloud experience. ZeroPC expands integration features with popular Web storage services including Dropbox.